on or about 16th of November 2017, approximately 90 days after segwit activation, bitcoin network will split into 2 independent branches: Bitcoin Core and Bitcoin Segwit2x (this will happen when block 494784 is mined). Segwit2x aims at increasing the current 1MB bitcoin block size to 2MB. Bitcoin Core will keep 1MB blocks. Here is a brief summary of the history leading to this occasion. Satoshi Nakamoto released first bitcoin software in 2009 and there was no block size limit for Bitcoin, except that implied by the 32MB message size limit. Later at the end of 2010, Satoshi decided to change the limit to 1MB, which was plenty enough at that time. The reason for such constraint was fear of network congestion that could be caused by spam attacks (it was possible to broadcast transactions containing no fee). Since then bitcoin increased in popularity and transaction limits started to hit the constraint set back in 2010. Majority of the bitcoin infrastructure today relies on the referential software client Bitcoin Core (currently representing about 64% of all bitcoin nodes). And a part of the bitcoin community is raising concerns that there is no immediate solution to the now constant congestion of the bitcoin network. Even though the bitcoin network operates at 100% of its capacity since January 2017, the Core developers are not in favor of the block size increase claiming that Bitcoin’s consensus rules should only be changed sparingly and with broad agreement from the entire community. This opinion is at odds with the Segwit2x initiative. On 25th May 2017 58 companies from 22 countries, (representing 83,28% of hashing power) agreed to upgrade the bitcoin protocol to so called Segwit2x, which in effect should increase the block size to 2MB causing a so called hard-fork. 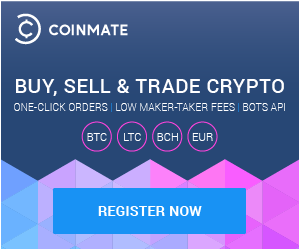 We at CoinMate will approach this situation responsibly and we will offer our clients the opportunity of choice. On the day of the split we will make a bitcoin balance snapshot and we will credit all clients owning bitcoin the same balance also in the other network. There is no action necessary on your side. Your bitcoins will be safely stored and access to bitcoin balance on both networks will be granted after the split as soon as it is safe. You will be credited B2X balance and deposits and withdrawals will be enabled once it is safe to do so.